It’s around this time of year that gardeners start to look forward to a bumper crop of potatoes but for those who have grown them before there is always the worry that the harvest will be spoiled by blight. Probably the most common plant disease, blight can wreck whole crops in a matter of a few weeks, as it did so devastatingly during the Irish potato famine in the 1840s where 1 million people died and a further 1 million emigrated. 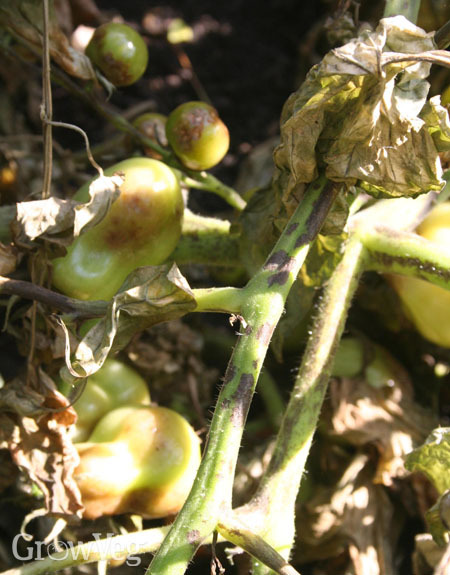 Although it is commonly associated with potatoes, blight also affects some other members of the Solanaceae family of plants, the most common of which is tomatoes. So what causes it and what are the best ways to tackle it? Blight is a fungal disease which spreads through spores blown by winds from one area to another, rapidly spreading the infection. The early signs can be hard to spot, although brown patches on the leaves and stems quickly appear (see above picture). There used to be only one strain of blight but in recent years a second strain has developed and the two types can mate, which is worrying since the resulting spores can over-winter, although this has rarely been seen in practice. Infected plants left lying on vegetable patches, or plants growing from infected tubers can both be sources of infection. Blight only spreads under warm humid conditions and the spread of blight each year doesn’t usually begin until a ‘Smith Period’ has taken place – defined as two consecutive days of temperatures above 10 degrees Celsius (50 degrees Fahrenheit) and humidity above 90% for eleven hours or more. That’s why 2007 was such a bad year for blight in the UK as the unusually wet and humid conditions aided the rapid production of the spores, furthered by rain washing them into the soil from infected leaves. Once a potato plant is infected it is important to quickly cut down all the plant which is above soil level, to prevent the disease travelling down into the potato tubers where it can make them inedible and rot in storage. For tomatoes there is usually little that can be done. If a plant is infected then it’s just a matter of damage limitation – getting what crop you can. Prevention is the best option, since no cure exists. So what can be done to stop the problem occurring? Fungicides: The classic approach to prevention involved spraying plants with copper-based fungicides such as Bordeaux Mixture, which used to be allowed in organic agriculture until its recent withdrawal. Although this works, to be properly effective the fungicides need to be applied before blight strikes and can easily be washed off by rain, resulting in many applications and residues being washed into the soil and watercourses – not great from an environmental perspective. Growing Early Potatoes: Because blight doesn’t usually spread until mid-summer, growing early potato varieties can overcome the problem and this is the approach I take since I love early salad potatoes. Earlies don’t usually yield as much as maincrop varieties but they can be harvested before blight strikes so you don’t risk losing your crop. Reistant Varieties: Recently a small number of resistant varieties have been developed such as Sarpo Mira and Sarpo Axona, showing the best resilience. I know many people who have benefited from growing these and there are apparently more varieties undergoing trials at the moment which is good, since blight has a history of constantly adapting! Growing Under Glass: For tomatoes, growing plants in a greenhouse or under cloches often completely prevents the disease from spreading onto them, although it’s less easy if there are lots of potatoes growing nearby. Good Hygene: It’s important to destroy all blight-infected plant materials, dig up and dispose of any infected tubers and make sure that none of them are composted. This prevents your garden from being the source of next year’s local blight outbreak! Likewise, it’s always a good idea to buy in fresh certified blight-free tubers each year. One of the problems with blight is recognising the early-warning signs. This year Forsite Diagnostics have launched cheap, easy to use testing kits called Pocket Check which are specifically aimed at amateur gardeners. It’s a really simple way to catch those early blight signs before they spread and will be a real help to those new to the problem. If you live in the UK then another way of picking up warning signs is through the Potato Growers’ Association’s Fight Against Blight webpages. There you will find detailed maps showing the current reported outbreaks of blight, as picked up by their 300+ expert ‘blight scouts’ around the country. They also have a full warning service of when a Smith Period has occurred in your local area on their Blight Watch service (for which you need to register) which, although aimed at farmers, is available to the public as well. "Some tomatoes on one of my plants have begun to get light brown marks on them, sometimes in a line sometimes in patches. So far it is only on one plant. The leaves and stems are healthy, but could this be some sort of blight. It has only appeared recently. I removed the marked tomatoes and disposed of them. I have seven very large plants, All grown in large pots which I cut the bottoms off and planted into grow bags, and am concerned whatever it is, may spread. Any advice would be appreciated. " "Lynda, It could be blight but you should also notice the edges of the leaves becoming browned as well, though not as marked as with potato plants. Given the very wet humid warmth we have had in the UK recently this is quite likely. The other possibility is blossom end rot - where a leathery dark coloured patch appears at the bottom of the fruit and this is quite common in grow bag planted tomatoes where the soil dries out - so you need to keep them well watered. If you decide it is blight then you need to get rid of the affected plant as it will quickly spread to the others, especially if the conditions are humid and the leaves get wet. If it is blossom end rot then just water more and you should be fine." "I have done as you suggest just in case it is blight, and disposed of the whole plant-which was a very big one with nearly 100 tomatoes on it....!! The light brown marks on the tomatoes, seemed to progress from smooth at first then turned scaly, but the leaves and stems still showed no sign of anything wrong, could not see any browning on any of the leaves when I took the plant out. Are there other pests / diseases that can cause scaly patches ? I bought Dithane just in case, but have not used it, SHould I do so now ? I have toms already ripening on a couple of other plants, especially the tumblers - should I take off the mature ones and finish ripening indoors or would it be too soon ? They vary from yellowy orange to early red stage. " "Lynda, it's always a pity when you have to destroy a plant and I hope we have advised you correctly! It is strange that the leaves have shown no sign - take a look at this webpage for common indicators: http://www.longislandhort.cornell.edu/vegpath/photos/lateblight_tomato.htm. Personally I would not spray the other plants but that is mostly down to my personal dislike of pesticides - you may choose differently and many farmers will be spraying given the current wet weather. You can certainly ripen fruit indoors if you wish - this works best with fruit that are already starting to turn a little yellowish as you mentioned. You can also cut off whole stems to ripen them indoors. However, unless there are any signs of problems on the other tomato plants I would leave them outside for now and keep a close eye on them. Good luck!" "Thanks Jeremy. Have checked the pics of diseased plants, but cannot see anything resembling it. The marks dont spread on the toms, they remain where they first appear and just go from smooth to scaly. I bought Dithane because the Garden centre said I would probably need it, but I began (and still really wish to be) chemical free. The thought of losing all my plants panicked me - but I will not be spraying. Just Living in hope." "On returning home from vacation I found that my whole garden had succumbed to the Blight. The tomato plants were unrecognizable. Wearing a mask and eye protection I pulled out all 51 tomato plants. The spores have attacked all of the vegetables, not just the tomatoes. At this point I’m pulling everything out and bagging the remains. The spores are heavy on the ground, how can I decontaminate the soil? " "Peter - you must be so disappointed to lose so much of your crop. You could scrape up the top layer of soil and replace it with fresh compost next year. In any case you must make sure that you get every last scrap of infected plant debris as this is how the spores overwinter. However, I think you won't be able to grow tomatoes, peppers or potatoes in those areas for some time, probably 2 - 3 years to be cautious. One last thing: I have not heard of blight attacking other vegetables, so you may want to get a second opinion on those. Or you could get a Pocket Check kit mentioned above to confirm it. Good luck!" "Jeremy – Thank you for the reply. Here in the Eastern US we have been under Blight warnings since early spring. My friends with local gardens have also lost their entire tomato crop and the inverted hanging tomato plants were no less vulnerable. The local papers have reported that the blight was largely being spread through local garden distribution centers." "I really would like to spray my potatoes for blight with a natural remedy, but cannot find any thing on the web that is available here in ireland (kilkenny) Really appreciate you help. Thank yuu. Carmel"
"Carmel, I've not heard of any natural remedy that is effective against blight - are you sure that such a thing really exists and works? You may have better results growing early resistant varieties." "i have read about piercing the plant with a piece of copper wire at certain points to prevent blight but i am unsure as to how to do this. " "Mike, I would be very surprised if the method using copper wire worked, since blight is usually spread by the spores on the leaves. However, do post back if you find out more and try it out." "ahhhhhhh i found it in the readers digest book secrets and tips from yesterdays gardeners and its to protect from mildew doh! "pierce young plants at 2 points along and at right angles to the main stem". my apologies. although i may just try this on next years plants. " "LAST YEAR, I CARRIED TOMATO PRODUCTION TILL FROST WHICH HAD EARLY BLIGHT....USED COTTON BURR COMPOST TEA...JUST SOAKED A COUPLE OF HANDS FULL IN 5 GAL BUCKET OVERNIGHT AND SPRAYED ON PLANTS...ALSO PULLED OFF ALL SPOTTED OR YELLOW LEAVES...GOOD LUCK THIS YEAR....I AM USING ALL NEW POTTING MIX SOIL IN CONTAINERS, BUT MAY NOT HELP...ONE GARDNER SAID TO BUILD A HOOP STYLE GREENHOUSE FOR 100 PERCENT PROTECTION, SHE IS PROBABLY RIGHT I THINK....I LOVE TOMATOES, FRESH, CANNED, FROZEN OR DRIED...LET ME KNOW OF ANY GOOD RESULTS..."
"I found a reference to Horsetail on littlegreenblog.com and will try that next year as I think it's too late this year. Does blight make tatties underground go gel like? Only one tattie per plant seems to be affected. Toms seem to have been affected earlier if it is blight, but tops seem to be growing again. At first I thought it was just mildew as it has been so damnably wet wet wet....."
"My potatoes are not blooming and I don't know why." "I have heard of using a dilution of milk to prevent mildew. Would this work on blight. I tried it on a Jostaberry one year which showed signs of mildew, and it miraculously improved the condition. The mildew visibly reacted, and definitely improved"
"I live in upper east Tennessee and tomato blight is a real problem , I am 61 years old and I live on a Farm , but a man older than me gave some advise that works. When the Tomato get's a base stem the size of your finger or larger , cut a short piece of naked copper wire ( like 10-2 electrical wire ) and push it thru the stem of the plant about 2 " above the ground . This will not harm the plant !! but the Copper sulfate in the wire, will be absorbed into the plant and prevent , many types of common blight's. I know what you are thinking ( he's crazy ) well , if you try it once ..you will thank me. I have also had this reverse , common blight ,that had already started."